Introducing our new co-host, Eden Robins! As announced at our November 5th edition, we'll have a new co-host soon joining the Tuesday Funk family. We're pleased to introduce Eden Robins! Eden is a great friend and supporter of Tuesday Funk who has read for us on at least three occasions in the past, including going above and beyond the call of duty on the night of our infamous February blizzard. She's had some short stories published in magazines that are now defunct, as well as magazines that are still up and running. 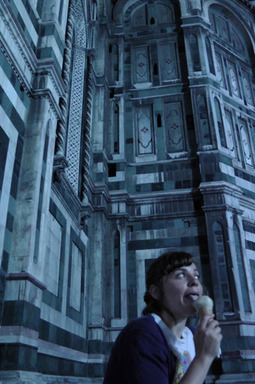 She is the founding editor of the online semiprozine Brain Harvest, also defunct, and is currently writing her second novel, a weird Western. For money, Eden makes what are essentially Choose Your Own Adventure websites that teach people about health insurance, but she's spent most of her adult life trying to sell you dildos. Eden horrifies writers everywhere with her unabashed hatred of cats. She has a website, too. "I think the top goal is to entertain," Eden says of her coming Tuesday Funk tenure. 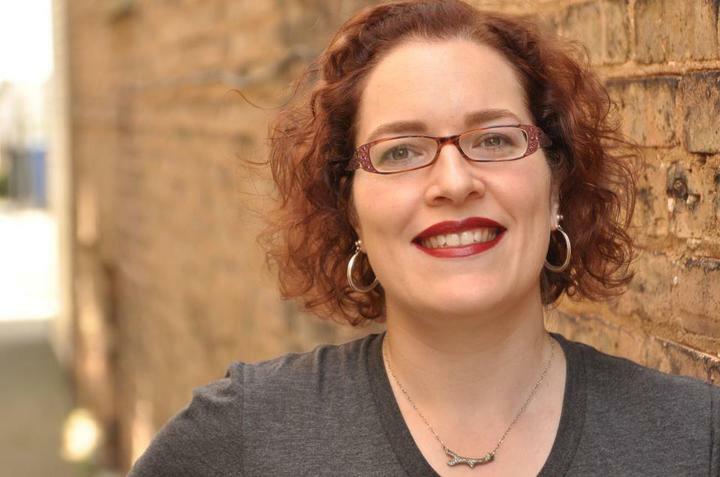 "There are a bazillion reading series in Chicago to choose from, and as much as I love stories and essays, one has to admit that it's not always the most compelling live show. I think the role of the hosts is to keep the audience entertained and coming back every month and to pick a variety of writing styles so that the readings stay fresh and interesting, and so there's more to the audience than a rotating group of cliques that come to see their friend and then leave." Warming our hearts, she goes on to say, "I just love Tuesday Funk and I want to see it get even more awesome!" Please join us at Hopleaf on January 7, 2014, when Eden makes her awesome debut as a co-host with Andrew Huff. And please come out to our next event on Tuesday, December 3, 2013, which features readings from G.P.A. (Greatest Poet Alive), Jocelyn Geboy, Davis Schneiderman, J. Michael Grey, andin his final appearance as a Tuesday Funk co-hostWilliam Shunn! You won't want to miss it! man and man: all love. defined by nature, not "god"
And if you enjoyed that, please come out to our next event on Tuesday, December 3, 2013, which features readings from G.P.A. (Greatest Poet Alive), Jocelyn Geboy, Davis Schneiderman, J. Michael Grey, andin his final appearance as a Tuesday Funk co-hostWilliam Shunn! You won't want to miss it! Eight times eight is sixty-four, so it only seems fair that we square the circle at our 64th big episode and bid farewell to longtime co-host William Shunn. The roster on December 3rd will feature G.P.A. (Greatest Poet Alive), Jocelyn Geboy, Davis Schneiderman, a freaking stage play by J. Michael Grey, and a reading by Mr. Shunn himself. Throw in a handful of our patented Haiku by Andrew, not to mention your pick of cold beers from around the world, and you've got all the ingredients for an evening sure to checkmate your early winter blues. 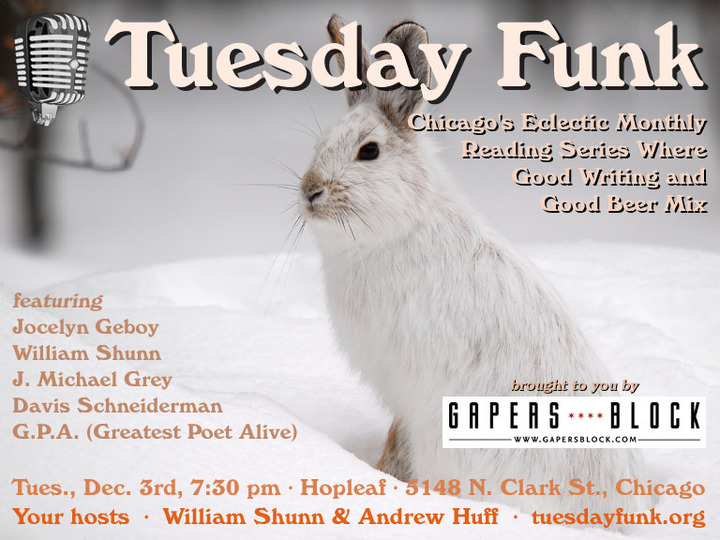 The evening gets underway with your hosts William Shunn and Andrew Huff on Tuesday, December 3rd, 2013, 7:30 pm, in the upstairs lounge at Hopleaf, 5148 N. Clark St., Chicago. Arrive early for a table and grab a beer from Mark at the bar. We start seating at 7:00 pm and no earlier. Admission is always free, but you must be 21 or older. And come early or stay late after for some great Belgian-style food downstairs. The folks lucky enough to have squeezed into the upstairs lounge at Hopleaf for our November 5th edition of Tuesday Funk know what a fantastic time was had by all. But if you weren't there, let us break down the awesomeness for you. We kicked things off with Rosamund Lannin, who took us trick-or-treating in the Castro of San Francisco. John Rich then hauled us up to Michigan's Upper Peninsula to visit a local dive bar. Co-host Andrew Huff brought us topical haiku appropriate to the season. And returning reader J.H. Palmer spirited us to Texas for a guided tour of Lee Harvey Oswald's Dallas. 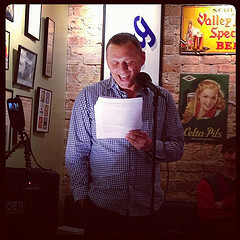 After a break for beer from Mark at the bar, co-host William Shunn brought us a new poem about trees and clapping or something. Next, Vojislav Pejović took us overseas to Belgrade for a look at a student and a nation rearranging themselves. And finally, Paul McComas and Greg Starrett donned costumes to unravel for us the mystery of Frankenstein's fine suita mystery we didn't even know needed solving! That's what you missed out on, but never fear! We'll bring you plenty of video excerpts in the weeks to come, and then we'll be back on Tuesday, December 3rd, 2013, for an evening with G.P.A. (Greatest Poet Alive), Jocelyn Geboy, Davis Schneiderman, J. Michael Grey, andin his final appearance as a Tuesday Funk co-hostWilliam Shunn! Please don't dream of missing it! Reminder: Tuesday Funk #63 is tonight! Don't forgettonight is Tuesday Funk's 63rd big episode, featuring Paul McComas & Greg Starrett, Vojislav Pejović, J.H. Palmer, John Rich, and Rosamund Lannin. Don't miss it! J.H. Palmer co-produces the monthly live lit series That's All She Wrote, which takes place the second Sunday of the month at Swim Cafe, and which recently celebrated its one year anniversary. She has appeared at a number of storytelling and live lit venues, and her work has appeared on the online publication The Toast. She is pursuing a Certificate in Creative Writing at the University of Chicago, and she just won the Annual Prose Award for non-fiction from the Guild Literary Complex! Please join Jessica and all our celebrated readers on Tuesday, November 5th, 2013, upstairs at Hopleaf at 7:30 pm. This 21-and-older event is free. Greg Starrett is a first-time author. He is a founder of Veidt Radio Theatre, which produces original Old Time Radio shows. Greg also is a fill-in music-show host and voice-over man for WJOB AM 1230 in Hammond, Indiana. He is employed as a telecommunications technician and enjoys foraging for wild foods, making jellies, mustards, and pickles, and beekeeping. A native of "Da Region," he lives in Munster, Indiana, with his wife and best friend Laurie, their cat Tippecanoe, and dog Tyler too. Together at Tuesday Funk Paul and Greg will perform a scene from their new novel Fit for a Frankenstein in full costume and makeup. Please join them and all our celebrated readers on Tuesday, November 5th, 2013, upstairs at Hopleaf at 7:30 pm. This 21-and-older event is free. John Rich is predominantly a writer of plays and essays. 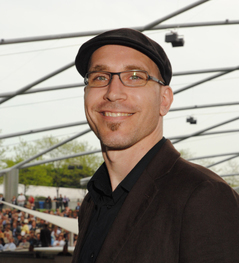 He earned an MFA in Writing at the School of the Art Institute of Chicago, where he teaches creativity in the Continuing Studies program. He is a recipient of the Václav Havel Fellowship in Playwriting from Western Michigan University and a Ragdale Foundation residency in writing. He co-founded the collaborative theater group Attention Deficit Drama (1997-2003) and currently performs with Every house has a door. 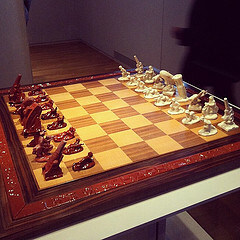 John's also one of those people who considers arts administration as part of his practice. He founded the Chicago Writers House and the Chicago Book Expo, and is currently the Director of the Guild Literary Complex. 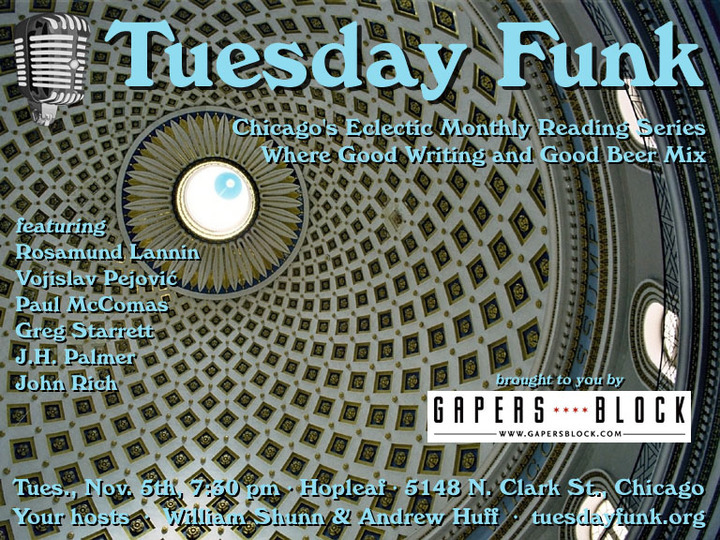 Please join John and all our celebrated readers on Tuesday, November 5th, 2013, upstairs at Hopleaf at 7:30 pm. This 21-and-older event is free.